In this video we are making a fun fabric sunglasses case made with some gorgeous Fat Quarters from my @PinkSewingBus partners @Hobbycraft. 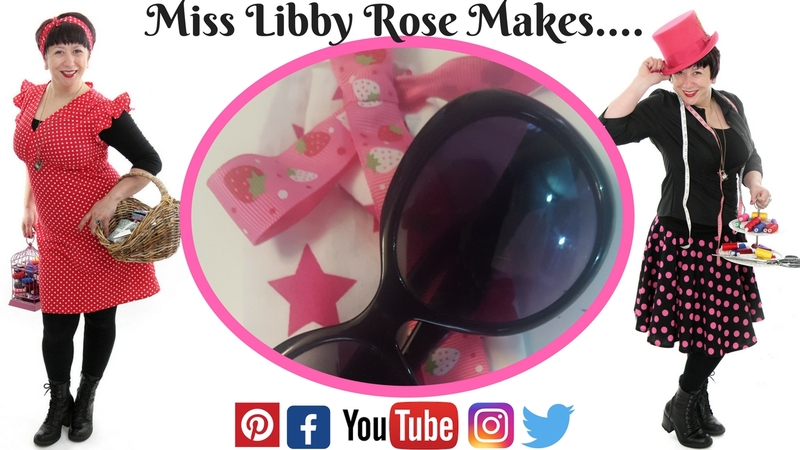 Join me @MissLibbyRose as I guide you through how to make this fun and quirky sunglasses case.. Soon you’ll be wanting to make one for everyone! Sewing machine : http://janome.co.uk/ with a button hole foot! Print out pattern at A4 size and double check this fits your sunglasses. Lay your fat quarter piece in half and pop the pattern with the straight line on the fold. Cut 2 x pieces of fabric on the fold… Be brave and bold with your fat quarters you can go clashy or matchy – the choice is yours! Create your button hole by using your one-step button hole foot (the long snap on foot.) Stretch it to the widest point so you have a nice big button hole here. Set the machine to the button hole setting. On the left side of the machine in the needle area pull down the lever which is the stopper to gauge the length of the buttonhole, put your foot down on the peddle and go! Once your buttonhole is created, lay the full fat quarter pieces with right sides together, pin along the top lines (above the buttonhole) and leaving a 1cm to 1.5cm seam allowance stitch the long first seam. Open the seam and fold the fabric so you are creating a long sausage, pin and stitch all around this super long rectangle. Go to the buttonhole, open up the buttonhole using seam ripper or small embroidery scissors. Use this buttonhole to pull the whole fabric through to the right side. Now you will have (again) a long sausage shape but with the fabric through to the right side now. Push one side of fabric inside the other and press flat. Now, go to your ribbon and pop a safety pin at the end of one side. Thread the safety pin with the ribbon attached through the buttonhole pushing it all the way around the top and meeting you back again at the buttonhole. Pull through, remove safety pin and tie in a bow. Untie the bow and slip glasses inside and re-tie! Viola you now have a fancy fabric sunglasses case!